I wasn't planning on visiting Minamishima. In fact I had never heard of Minamishima til the weekend before I flew down to Melbourne for a business trip. My wife was browsing around Instagram one night and randomly discovered Minamishima, a sushi-ya that was describe to be "just like Japan". Being the sushi nut that I am, I declared that I needed to visit Minamishima. Fortunately, I was able to secure a Thursday night booking quite easily as they had only just opened for about a month and are not that widely known... yet. Minamishima was opened by chef Koichi Minamishima in November after spending many years at Kenzan as their sushi chef. Minamishima is located in a quiet, nondescript space just off Bridge Road in Richmond. The dining room is just like a sushi-ya in Japan. Diners are seated along a wooden counter (with enough seating for twelve) and get to watch two sushi chefs meticulously prepare each piece. There are also a few tables at the back for groups, but the seats at the sushi bar are the best seats in the house! There is no menu at Minamishima. Instead there is a $150 omakase menu that consists of an appetiser, 15 pieces of nigiri sushi, shinjo-wan (fish dumpling in clear broth) and one dessert. You can also choose to have sake or wine pairings for $70. I opted for the sake pairings. Like the food, the sakes start off light, making its way up to stronger and richer sakes. The meal started with an appetiser of assorted vegetables. There was a tomato cooked in dashi, eggplant cooked in a sweet and savoury sauce, mustard greens topped with bonito flakes and pumpkin. Each of these vegetables were well cooked and enjoyable. The first nigiri of the night was king dory.The king dory had a firm texture and a mild, sweet flavour. This piece was already seasoned with light soy by the sushi chef. The first sake of my sake pairing was Kirei Shuzo Karakuchi 80 Junmai Nama Genshu from Hiroshima. This was a light refreshing sake that was dry on the palate, which went well with the milder flavoured fish early in the omakase menu. The next piece was seared alfonsino from New Zealand. The texture of this piece was soft and melting in the mouth and the gentle sweetness of the alfonsino was paired with grated radish. Alfonsino was quickly followed up with King George Whiting. This was the first piece where the chef instructed me to use soy sauce. The King George Whiting was impeccably fresh and a shiso leaf was hidden underneath to add a refreshing, peppery note to the whiting's subtle flavours. Next was octopus from Western Australia. The octopus was pleasingly tender whilst still retaining a slightly chewy texture. There was a nice depth of flavour that was brought out by tsume. The texture of calamari was amazing! The calamari was expertly scored to tenderise the flesh, which gave it an almost milky texture. The calamari was simply seasoned with lemon and shiso salt to draw out the sweetness of the calamari. Japan may have botan ebi, but scampi (from New Zealand) is a more than capable substitute. This scampi had an intense sweetness and a beautifully creamy flesh. Mindblowingly good! The next sake was Dewazakura Junmai Ginjo Dewa Sansan from Yamagata. This sake was soft and deep flavoured with a good amount of acidity and a clean, crisp finish. The next three pieces were shellfish that Minamishima has imported from Japan. All three were special and are rarely seen in Japanese restaurants in Australia. Tairagai is a bit like scallop except I think tairagi has a better texture for sushi. The meat is firmer and more much substantial. This piece was seared, which brought out even more of the tairagai's sweetness and umami. This was my favourite out of the three Japanese shellfish. Mirugai (from Japan) was cut into strips and topped onto a block of rice and wrapped with nori to form a gunkan. I loved the crunchy texture of the geoduck, which was sweet and carried the aroma of the sea. Next was torigai (also from Japan). It had a slightly chewy and springy texture. The cockle's sweet flavour was paired with ginger. Engawa (the muscle of the dorsal fin of the Japanese flounder) was pure bliss! This part of the flounder has a high fat content, which made it very soft and melting in the mouth. There was an incredible depth of flavour and the sweet aroma of the engawa spread across my palate. The third sake from the sake pairing was Terada Honke Katori 90% Junmai Kimoto Muroka Nama Guenshu from Chiba. The sommelier explained that this sake was produced using older, traditional methods, a rarity these days. The sake had a lovely rich rice flavour with refreshing acidity and a delicate floral aroma. I moved from one orgasmic moment to the next with this maguro otoro (bluefin tuna belly from Japan). There are very good reasons why the otoro is so highly prized. 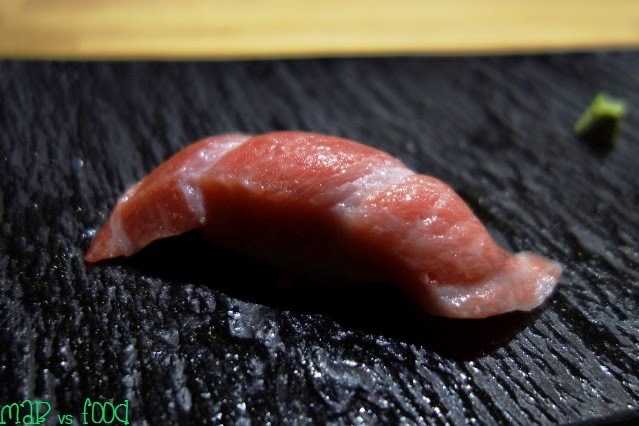 The flavour of otoro is just unrivalled: so deep, complex and rich in umami. And the flesh was ridiculously smooth, seemingly just melting away on the tongue. This was piece so good that I wanted to cry! Naka Shuzo Asahi Wakatsu Junmai Muroka Nama Genshu from Tokushima was selected to be paired with otoro. This sake was rich, with fruity and spicy notes and a woody finish. This was my favourite sake of the sake pairing. 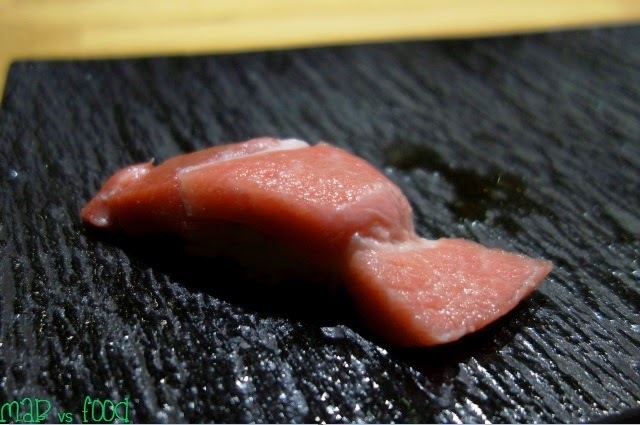 Otoro was then given the blowtorch treatment (aburi) to melt some of the fat into the flesh. Predictably, this piece was heavenly with a buttery mouth feel and amazing flavour. Next was battera, an Osaka style pressed mackerel sushi. The mackerel was cured in rice vinegar, which provided a wonderful balance to the oiliness and strong flavour of the the mackerel. This piece was amazing and confirmed why I enjoy mackerel so much in sushi. The next pairing, Pennyweight Constance fino from Beechworth, Victoria, was actually a wine rather than a sake, as the sushi chef wanted something richer to go with the remaining stronger flavour pieces. As I am not much of a wine drinker, I would have preferred sake. The next piece was another pressed sushi, this time with anago (conger eel or saltwater eel from Japan). The eel was so soft and evaporated instantly in the mouth, like a souffle from Vue de Monde. The sauce was sweet and filled with umami. I did think with the softness of the eel, that the block of rice was a bit big. I love sea urchin and my eyes lit up when I saw the chef fill a little dish of cucumber with Bafun uni from Hokkaido. The rich, creamy texture of the sea urchin was heavenly in the mouth. A heavy sweetness and aroma of the sea urchin filled my mouth. The crispness of the cucumber worked well as a base for the sea urchin, but I think I have a preference for rice. After the sea urchin, the sushi chef indicated to me that I had final piece in the omakase menu and asked whether I wanted any more pieces. I decided to order another piece of otoro, since the first piece was so orgasmic and I was here any way, so I may as well make the most of my visit. This might be the most expensive single bite I've ever had, but it was totally worth it because otoro is one of life's greatest pleasures! The final savoury course of the omakase menu was shinjo (a dumpling made from kingfish and calamari), submerged in a clear dashi broth. The flavours of this course were clean, refreshing and really delicious! The final pairing of the night was Ota Shuzō Dokan Umeshu from Hyogo, a sake infused with ume or plum. This was one of the best ume-shus that I have ever had. The tart flavours of ume were wonderfully balanced with moderate sweetness, creating a ume-shu that was really pleasant to drink and not sickly sweet. A rice milk pudding with a dark sugar syrup from Okinawa and summer fruits (raspberry, strawberry and dark grape) was served for dessert. Dessert was simple yet highly enjoyable. I loved the smoothness and the creaminess of the pudding. This dessert was served with a cup of hojicha (roasted Japanese green tea). Massive damage done to my bank account! Minamishima is not cheap, but then again neither are high end sushi-yas in Japan, which Minamishima is trying to emulate. Despite only being open for a month, Minamishima has done an outstanding job in creating an exquisite sushi omakase experience in Australia. Each piece was amazing and there is no doubt that the sushi chefs here are some of the best in the country (alongside Sano-san of Sokyo). Minamishima is probably the best option Australians have for a true sushi omakase experience, outside of booking a flight to Japan and eating at one of the Michelin star sushi-yas. Lowlight: No tamago (egg omelette) to end the sushi omakase.